Eggs possess some interesting properties, making them ideal for cool science experiments for all ages. They are surprisingly strong and can be used in projects demonstrating that strength. Other interesting experiments utilize the egg to prove other hypotheses, including chemical reactions to shells and how air temperature can create a vacuum in a bottle. The shape and composition of an egg shell provides the egg with stability and strength. 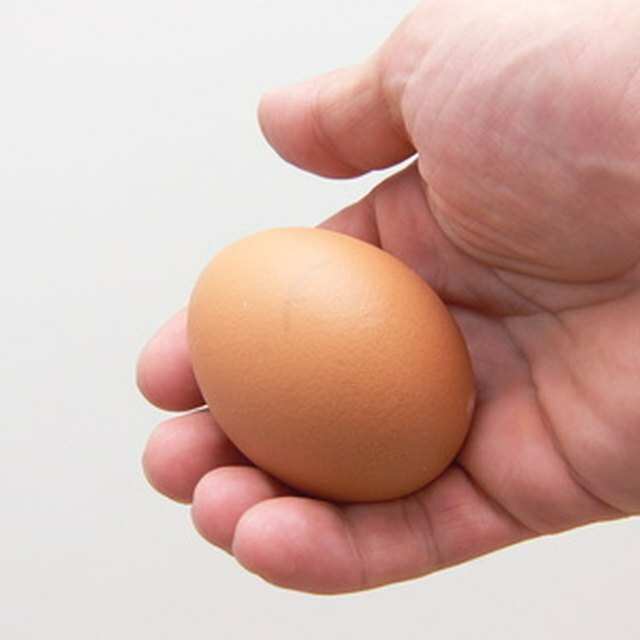 Show how strong the egg is by asking children to put an egg in the palm of their hands, hold their hands over bowls and squeeze it, trying to break it. The egg should not break. Tell them to hold the egg between their thumbs and forefingers and squeeze again. For one final test of the egg's strength, pile three or four heavy dictionaries on top of four eggs and ask the children if the eggs will break. They will be amazed when the eggs do not break. Show how a raw egg will sink in water but float in salty water. Make a solution of saturated, salty water by adding about 4 tbsp. of salt into 2 cups of water. Have another glass of plain water. Drop the egg into the glass of water, and it will sink to the bottom. Ask the children if the egg will sink to the bottom of the glass of salt water. They will be surprised when it floats. Explain that salt water is more dense than plain water, explaining why the egg floats on top. Tell the children you will be able to get a hard boiled egg into a bottle without breaking the egg, even though the egg is larger than the bottle opening. Smear some water around the opening of a bottle that has a mouth slightly smaller than the egg. Light a strip of paper on fire and drop it into the bottle. Quickly put the egg on the mouth of the bottle, and the egg will slowly be sucked into the bottle. Explain the reason the egg goes into the bottle is because the heat from the fire creates a suction that pulls the egg in. The calcium carbonate in egg shells makes them hard. Acetic acid, such as vinegar, can break down calcium carbonate. Place a hard-boiled egg into a container and cover the egg with vinegar. Note the chemical reaction that is taking place by observing the bubbles that are rising from the egg. Take the egg out the next day and feel the egg. The shell should be soft. Leave the egg out for a day, and the next day the egg will be hard again because it used the carbon dioxide from the air. Tinus, Donna. "Cool Science Experiments With Eggs." Sciencing, https://sciencing.com/cool-science-experiments-eggs-7926668.html. 24 April 2017.